In the third century BC the island of Sicily was about to witness a serious transformation. Previously there had been two main zones on the island. In the Punic west the Carthaginians were the leading force, while the eastern part of Sicily was dominated by the Greeks, the tyrants of Syracuse in particular. The coming of the Romans in 264 BC changed all this. They first ended the Punic presence on the island, before conquering the Syracusan kingdom half a century later. From then on all of Sicily was Roman territory, which it would remain for nearly seven hundred years. This change of power also meant a shift in the Sicilian network. Before the start of the Punic wars the Sicilians were largely dependent on the wishes of Carthage and the Greek world, but the Roman conquest meant that they would have mainly one power to gratify: Rome. From the beginning of the fifth century BC onwards, Sicily had been the stage of several conflicts, mainly between the Carthaginians and the tyrants of Syracuse. They both had their reasons for these wars. The Punic west was an important part of the trade empire of Carthage. The cities of Panormus and Drepanum were quite useful to the Carthaginians as they proved to be excellent transit ports for the lucrative trade with the Tyrrhenian coast. Moreover, Lilybaeum was built at the beginning of the fourth century BC and this well-defended port would play a huge role as a transport hub in the years to come. The Carthaginians therefore occupied a large part of Sicily not to exploit its resources, but to protect those important ports. In the Greek eastern part of Sicily, however, the tyrants of Syracuse had other reasons to go to war with the Carthaginians. They needed political legitimacy, which they found in these conflicts. Agathocles (r. 317-289) for example propagated his war against the North African city as a western sequel of Alexander’s conquests. In order to strengthen his claims and position, he also behaved like Successors of the Macedonian king, the Diadochoi. In 306 he even had himself crowned king, which also resulted in the adaptation of Hellenistic practices, such as the employment of his own court historian. Although Agathocles died without an heir, his adapted customs were used by subsequent Sicilian rulers as well. 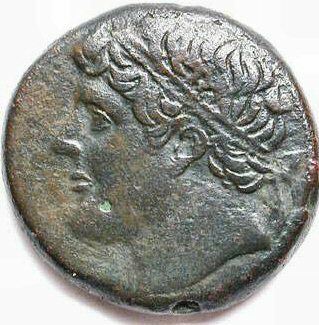 Phintias of Acragas, Pyrrhus of Epirus and Hiero of Syracuse all had themselves crowned king and the latter even had an extensive entourage. Due to Agathocles, therefore, Hellenistic practices were successfully adopted in Greek Sicily. In 264 BC the Mamertines from Messana called Rome for help against king Hiero II of Syracuse. As Carthage and Syracuse reacted quite hostile to the Roman acceptance of this request, the first Punic war broke out, which would change the situation in Sicily drastically. The Romans swiftly drove off the Carthaginians from the island, but as the navy of the latter was superior for a long time, the war lasted until 241 BC. While due to the Roman victory Carthage was completely expelled from the island, the kingdom of Hiero became one of the richest areas of the Mediterranean world. Already in 263 BC Rome and Syracuse namely had come to an agreement, which put Hiero’s kingdom under Roman protection in exchange for minimal war reparations and an alliance. This friendship was quite beneficial to both Rome and Sicily, but the death of Hiero in 216 BC meant the end of it. A second conflict (218-201 BC) between Carthage and Rome had begun. Because Rome initially seemed to be the weaker party, Hiero’s successors thought it wise to switch sides and concluded a treaty with the successful general Hannibal. Rome responded by sending an army to Sicily, which managed to capture Syracuse in 212 BC and afterwards defeated the invading Carthaginians at Acragas. As a result, all of Sicily was Roman territory by 210 BC. This being the case, the Romans increasingly exploited the resources of the fertile island, and its grain in particular. Sicilian corn was already exported in large quantities in earlier times, but the Romans not only increased its production even more, they also became its primary customer. Grain was especially used to feed both the Roman army and the population of the ever growing city. Thus, with Sicily as its principal food supplier, Rome was able conquer all of the Mediterranean. The Roman presence on Sicily meant a major network transformation in two ways. First of all, the two ‘strong tie’ networks that used to dominate the island, that of the Carthaginians and the Greeks, increasingly became a unified whole after the Romans entered the scene in 264 BC. From the fall of Syracuse on, the Sicilian cities no longer had to deal with the wishes of Carthaginians and Greeks, but they were more and more dependent on the will of their new ruler. Besides being the ruler of Sicily, Rome also was its prime consumer. Another interesting change in the Sicilian network was the extent of impact of the Hellenistic rulers. As mentioned above, Agathocles successfully introduced the customs of the eastern monarchs in Sicily. In doing so, the ‘weak tie’ between the Syracusan king and his Hellenistic colleagues transferred an eastern practice to the ‘strong tie’ network of Sicily in the western part of the Mediterranean. The tie between the Hellenistic kings and the Sicilian rulers remained intact until the Romans conquered the island. Needless to say, in the kingless early Roman Empire most of the eastern monarch customs were ignored. De Angelis, F., 'Going against the grain in Sicilian Greek economics', Greece & Rome, Second Series 53, no.1 (2006): 29-47. Finley, M.I., Ancient Sicily. (London: Chatto and Windus, 1979). Hoyos, B.D. (ed. ), A companion to the Punic Wars. (Malden: Wiley-Blackwell, 2011). Miles, R., Carthage must be destroyed: the rise and fall of an ancient civilization. (Londen: Allen Lane, 2010). Smith, C.J., & Serrati, J. (ed. ), Sicily from Aeneas to Augustus: new approaches in archaeology and history. Edinburgh: Edinburgh University Press, 2000). Header: fragment of John Brett's 'Mount Etna from Taormina' (1870), from Graves Gallery, Museums Sheffield.